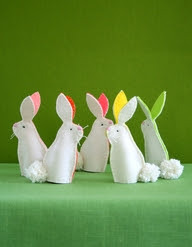 i have been thinking about easter lately as its only a short time away. we don't celebrate easter in a huge way. but we do love hot cross buns and an easter egg hunt. having a little one in the house again has reminded me of easter times when my oldest two were small, pajamas on with dressing gowns over for warmth, gumboots, baskets in hand excitedly running around the garden finding hidden eggs. always so early in the morning and always so much fun! they had chocolate eggs but jess is yet to discover chocolate and i would like to keep it that way for a little longer. so what to do? 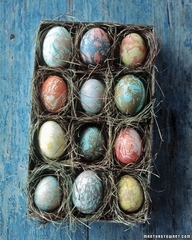 i have found many images and tutorials on pinterest for the most gorgeous eggs. 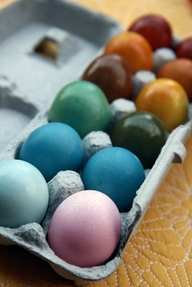 i always thought that these kind of eggs were blown but some i see seem to be hard boiled. less breakages i guess. so i think i may dye some. i love the ones pictured above that are dyed using natural dyes made from plants and roots. i think they are so pretty. i also like the marbled ones but they look like a bit more work. i am also thinking of making a few little things from felt. maybe a collection of chicks. 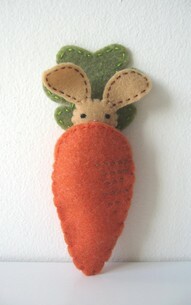 i love the carrot pocket with the bunny inside and the little white finger puppet rabbits would be great for storytelling. 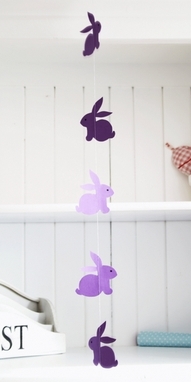 i quite like the purple rabbit garland and it would be cute to hang in jess's room. this is available as a free printable from here so i think that will be on the list as well. 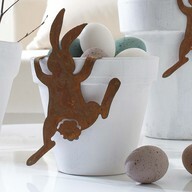 and i wish i could figure out a way of making the bunny hanging on the pot of eggs at the top. it is made from some sort of metal and sold from a european website but maybe with the right thickness of paper a similar result could be acheived. adorable! so many things i want to make! thanks to pinterest where all of the above images have come from. oh and jess may be lucky and get one chocolate easter egg... maybe!